When the movie Jimmy P. came out in 2013, I discussed the redface casting of Benicio Del Toro as a Blackfeet Indian. Now the movie has made it to Japan, or something, because a recent article raised the issue again. By Giovanni FazioDel Toro, for his part, put in some work trying to master a proper Blackfoot tribe accent, but the result is more than a little off-putting. His pattern of speech is so painfully laconic and halting that it almost comes off as a caricature, especially since all the other Native Americans cast in the film sound much more contemporary and colloquial. 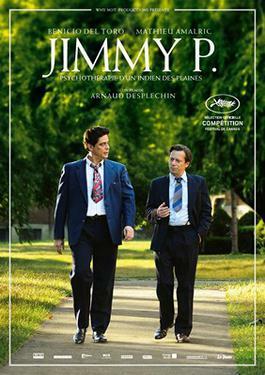 It’s unfortunate that this wasn’t noticed by French director Arnaud Desplechin (“Kings and Queens”)—this is his first attempt at an English-language film. Furthermore, the issues of racial discrimination that are raised tend to lose their bite when apparently not one actual Native American actor could be found to play the lead role. A Freudian slip?Comment: In the past, Desplechin said they couldn't find any Native actors while Del Toro said it was a money issue. I ripped these positions in Director: Native Actors Lack "Charisma." Then I could only guess how badly Jimmy. P would do at the box office. Now we know. Box Office Mojo reports that it earned a pathetic $24,329. Not $24 million, $24 thousand. So much for all the asinine claims that Del Toro is a big star who could earn big bucks for investors. The producers could've cast anyone, even me, and the movie would've earned just as much. Someone could've earned $24K by screening home movies of pets and babies. The fallacy of the big-name actor strikes again. These actors are worthless from a financial standpoint--at least in movies like this one. There's no financial reason--none--for hiring Del Toro rather than a Native actor for Jimmy P.
The producers hired him because they were "familiar" or "comfortable" with him. In other words, because he was white like them. That's a typical example of discriminating on the basis of race, or racism.